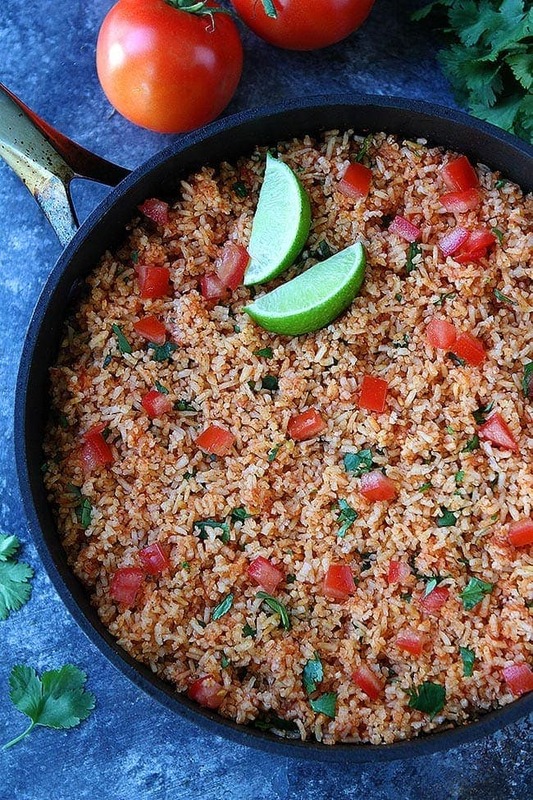 Mexican Rice is easy to make at home and tastes even better than the popular restaurant rice. This easy side dish goes great with any Mexican meal. 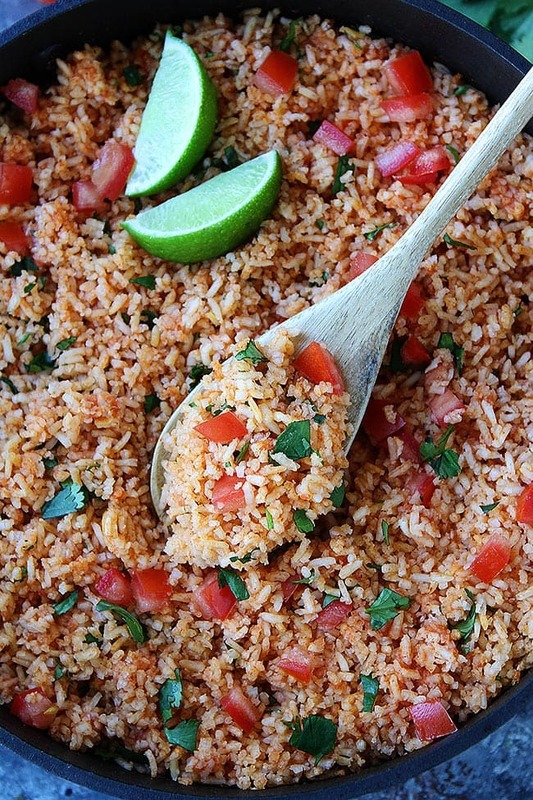 Mexican rice is a standard side dish at almost every Mexican and Tex-Mex restaurant. Almost every meal comes with Mexican rice and beans. I always fill up on chips and salsa and usually don’t have room for my rice, but Josh LOVES Mexican rice and always eats his portion and mine. 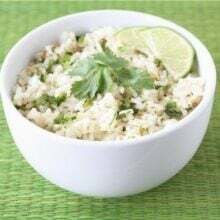 We don’t eat out that often and so Josh decided to make his favorite Mexican rice at home and I have to say his Mexican rice recipe is better than any Mexican rice I have ever tasted at a restaurant. It is so good I don’t share with Josh. I eat all of my rice by myself. And our boys love it too! It is a hit with the whole family! Don’t worry, this rice isn’t spicy at all, it just has amazing flavor! 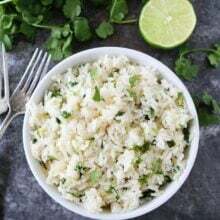 This Mexican rice recipe is easy to make at home and SO much better than store bought packets of Mexican rice. Homemade, from scratch, Mexican rice is the way to go! It is worth the extra effort and we promise it is easy! First, rinse your rice under cold water in a fine mesh strainer. Do not skip this step! Rinsing rice removes the starch and will prevent the rice from clumping up and sticking together. Use whole canned tomatoes and not tomato sauce. We like the flavor of whole tomatoes better, they give the rice a more “real” tomato flavor. Blend the whole tomatoes in the blender or food processor with the onion and jalapeño. You will only need 2 cups of the tomato sauce for this recipe. We like to freeze the remaining sauce in a freezer bag so we have it on hand to make Mexican rice the next time! Bring 2 cups of the tomato sauce with the broth, garlic, and spices to a boil and simmer for 15 minutes so the flavors can come together. While the sauce is simmering, toast the rice. Use a large nonstick pan so the rice doesn’t stick. Toast the rice with 2 tablespoons of vegetable or canola oil. Cook stirring frequently, until the rice is golden brown and toasted. Cook the rice in the tomato sauce to give it lots of flavor. Make you sure you cover the rice and don’t lift the lid until it is done cooking, about 20 minutes. We don’t add veggies, but you can add diced carrots, peas, or corn to the rice if you wish. When the rice is done cooking, let it sit for 5 minutes. Add lime juice and fluff with a fork. Stir in the cilantro and fresh diced tomatoes. 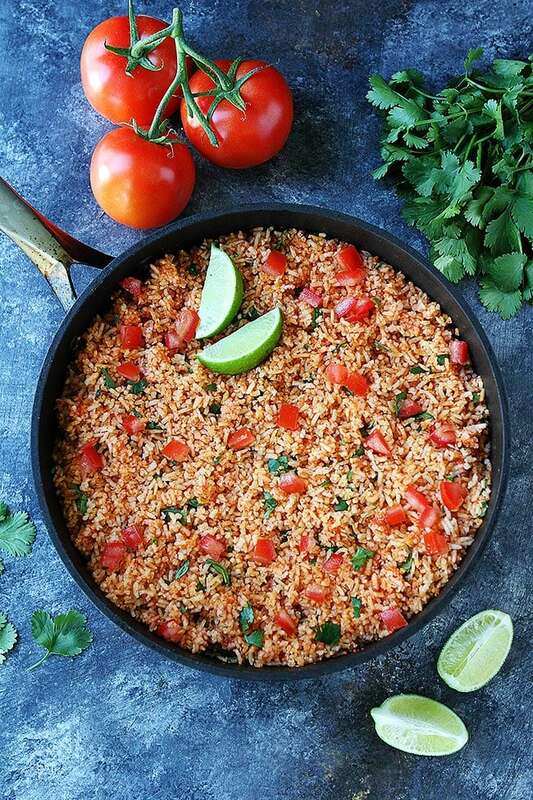 The next time you are making Mexican food at home, add Mexican rice to the menu too! 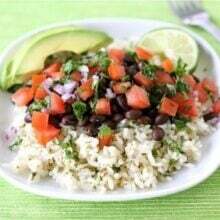 You will love this restaurant-style Mexican rice! 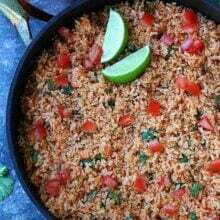 The BEST Mexican rice recipe and it's easy to make at home! 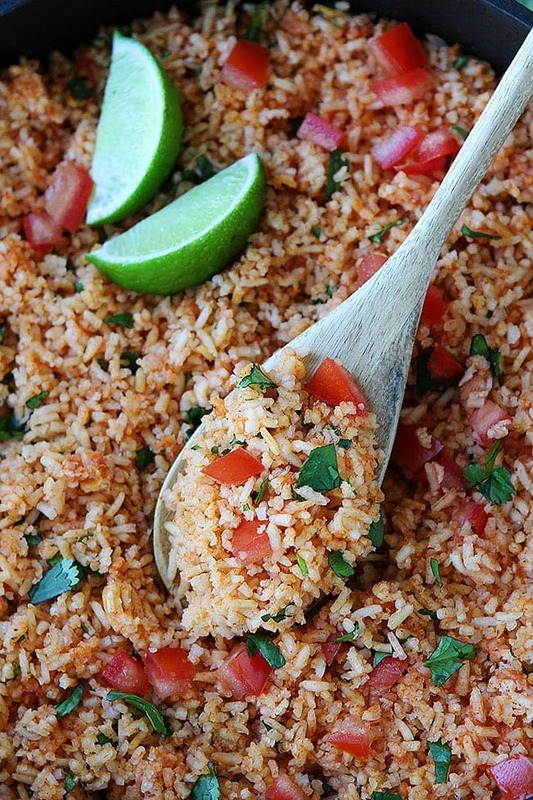 Serve this easy Mexican rice with your favorite Mexican dishes! Place the rice in a fine mesh strainer and rinse well. Spread the rice on a sheet pan lined with paper towels. Pat the rice with paper towels to help it dry faster. Let it sit while you prepare the sauce. In a blender or food processor blend the tomatoes, onion, and jalapeño until smooth. Measure 2 cups of the tomato sauce and reserve the remaining sauce for another time. We freeze the leftover sauce so we have it on hand to make Mexican rice anytime. Pour 2 cups of the tomato sauce in a large skillet and add the broth, garlic, salt, cumin, chili powder, and cayenne pepper. Bring the sauce to a boil and then turn to low and simmer for 15 minutes while you prepare the rice. In a large nonstick skillet, heat the oil over medium high heat. Add the rice to the pan and toast, stirring constantly for 10 minutes or until the rice is golden brown and toasted. Add the tomato sauce to the large skillet with the rice and stir to combine. Bring to a boil. Cover and reduce heat to low. Cook until rice is tender, about 20 minutes. Don't lift the lid to stir, just let the rice cook and absorb all of the tomato sauce. Let the rice sit for 5 minutes. Add the lime juice and fluff the rice with a fork. Stir in the cilantro and diced tomatoes. Serve warm. It is so easy and so good! Enjoy! I did not make this recipe, but the colors and the flavors are making my mouth water. I did leave a comment on your buttermilk banana bread. I have been trying for Years to get mine to look like yours. I use an almost identical recipe. However, I’m wondering what exact type of pan you use. What it’s made out of Etc. I purchased an expensive loaf pan at Williams-Sonoma and still it doesn’t get done in the middle before everything else is overdone. I am going to try your recipe, but with my pan I have a feeling I am going to end up with the same dark loaf even though I don’t use cinnamon or brown sugar.. I hope you try the rice! It’s so good! Ha – I almost always eat way too many chips and dips when I go out to Mexican restaurants and I can’t eat my rice either. So maybe I need to start making it at home. Looks so delicious! 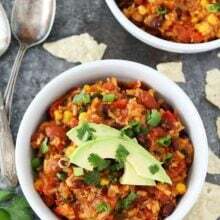 Mexican rice is my girls absolute favorite and I love it too- total comfort food for our family! Homemade versions of restaurant classics are my fave! Now I’m SO in the mood for Mexican food!! Such an easy and flavorful side dish! Sure to become a go-to for Taco Tuesday! Hello! Can you use water instead of broth? Any recommendations for seasoning if using water instead of broth? I use to make the Pioneer Woman’s recipe for Mexican rice but this has replaced it, I love how fresh this recipe tastes! I always use the make-ahead option for freezing the extra sauce for the next time. Today, instead of measuring out the 2 cups of tomato sauce and freezing the rest, I decided to go ahead and complete step 3 before freezing the unused half (of course increasing the broth, garlic, and spices). Next time, I’ll just have to pull the sauce out of the freezer (ahead of time) and add to the rice to cook. Mexican rice even faster! Yay, glad you love our recipe!